These are three quiltlets that I made for a Yahoo Group Swap. 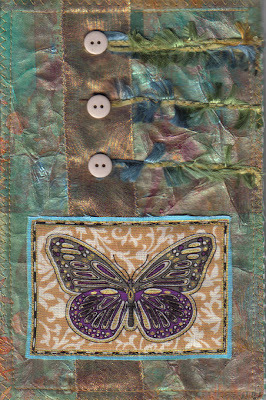 The base layer is my fabric paper, to which I added the collage elements. Very, very nice Daphne! I just love the colours. as usual...you are so talented. Your art is beautiful Daphne , I love these! I'm so glad you joined this swap. Your work is stunning. Really beautiful colors and artistry. Thank you all for your most wonderful comments. I enjoyed working on these pieces and really appreciate your support. These are so neat!!! I love the central butterfly focal points. Lovely job! These are just so gorgeous! I love butterflys. Your colors are nice. 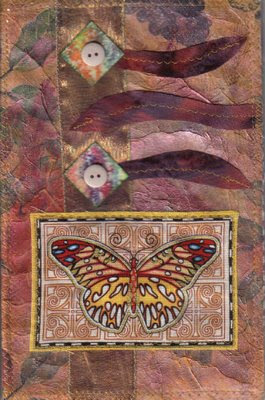 Stunning quiltlets...you have a wonderful sense of color...the combinations are lovely! Being only a new member of the group, I have been reading through the daily posts and just love your finished projects. Still a bit hesitant about starting out, and posting to the group. 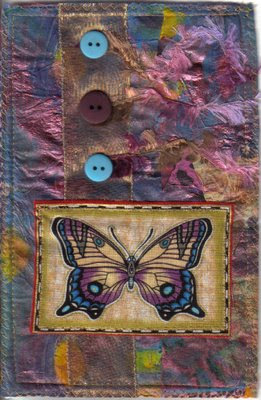 Like your idea with the collage fabric sheets.